Traveling the world often means coming across different cultural traditions that at first sight might seem bizarre. The most common example would be eating strange types of food that you’re simple not used to. However, when I was in South Africa, I started to become curious about another cultural tradition, funerals. While sitting in a restaurant in a South African township, I saw a big poster of an insurance company offering coverage for funerals. My local friend explained that in the life of a South African, a funeral is way more important than a wedding or graduation. He said that people simply care more about how others see their last event, even though they aren’t really there to attend it. Unlike a Western funeral where overt displays of grief and sadness are common, funerals in South Africa are treated as celebratory events. While some might think that a funeral is simply digging a hole and then crying for a bit, history has proven that there is no end to man’s creativity even when it comes to funeral traditions. Your funeral could not be more fun than in Taiwan, where people believe that a spirit should be happy when leaving the mortal realm. According to the Taiwanese, the best way to make a spirit happy is by hiring a few strippers, naturally. Finding a group of strippers is incredibly easy since they travel around the country waiting for someone to call on them. Breast in peace I guess! Famadihana, also knows as the return of the bones (Doesn’t it sound like a title of a horror movie? 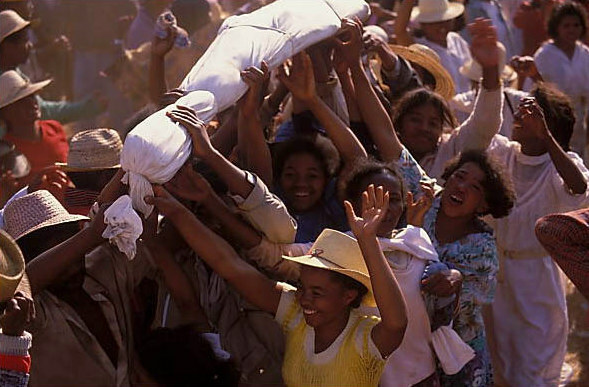 ), is a funerary tradition of the Malagasy people from Madagascar. Families dig up the tombs of their ancestors and bring their bodies to their homes where they change their clothes and dance with them. It’s meant to establish a connection between the dead and the living. After the party is over the dead are re-interred until the next get together. Another peculiar tradition known as a sky burial has been kept by the Zoroastrian communities of central Asia. People prepare the body of the dearly departed by cleaning and bathing it before placing it on the top of a religious temple to be eaten by vultures. The idea behind this tradition is that the dead must get rid of their physical forms so their spirits can be released. A similar yet completely different tradition exists in Papua New Guinea except that instead of vultures, the deceased’s friends and family actually eat them! Not only that, the members of the family cut a piece of one of their fingers off as an expression of sorrow. If I ask you to imagine a coffin, you probably think of a box in the ground. However, some Asian communities don’t share this perspective. They believe the closer the coffin is to the sky, the closer the spirit is to heaven. Seems logical I suppose. To achieve this, they hang their coffins on the side of cliffs. What are the chairs doing there as well? The body is often placed in the house of the family for about a week, sitting in a chair, which in the end gets placed on the cliff with the coffin. 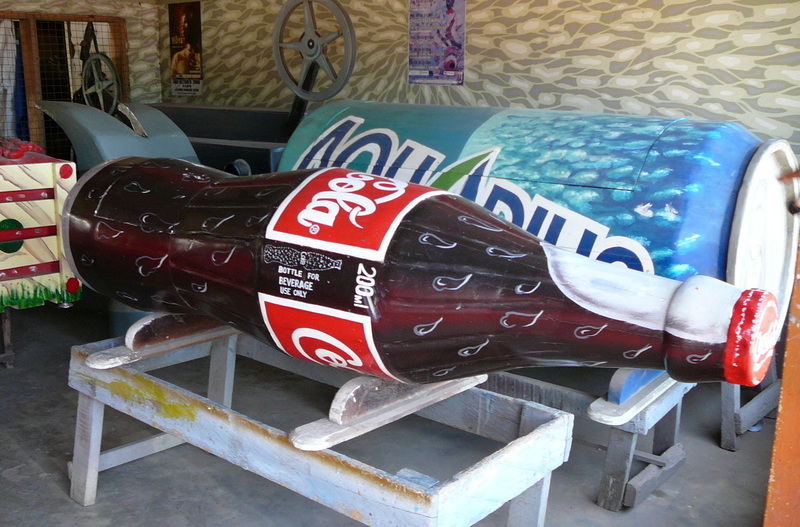 Artists in Ghana have become world famous for their especially artistic coffins designed to represent a particular characteristic of the deceased. The whole tradition started from a plane-shaped coffin made for a grandmother who didn’t have enough time to travel the world before she died. You can order a coffin in any shape you like so you better start thinking of ideas! Those who think these traditions are strange might be interested in reading about a new type of funeral in the United States. 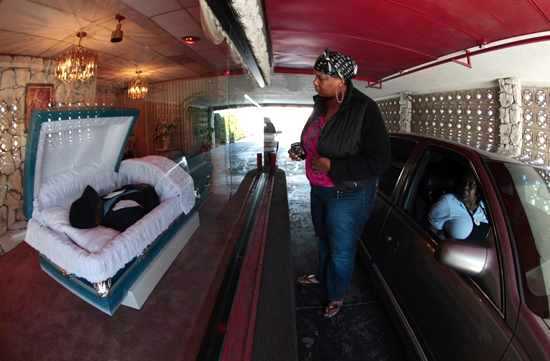 We’re all familiar with the concept of a drive-thru fast food restaurant, but some Americans actually applied this to a funeral. You can drive in, sign a book, and look at the body without even leaving your car. I’m not so sure about China, but for the Chinese communities in Southeast Asia, we also prepare a lot of offerings for the deceased. We will prepare paper replicas of Mercedes, big house, and tonnes of billion dollars hell notes and burn them in the funeral. It is supposed to rise up to the heavens and translate to the real things for our deceased relative. Oh really? That sounds super interesting! Does this habit exist only in some specific communities? I would say, this is the practice for people who came from southern China, from provinces like Guangdong and Fujian. Most of us in SEA have our ancestors from these 2 provinces. craziness! The returning on the bones just seems creppy! I can help to laugh reading this post. But I feel guilty doing that because I want to pay respect to the dead. So I will just say, it is indeed interesting. I enjoyed it…plus it is worth sharing! Hanging coffins can be also seen in Sulawesi, Indonesia. Oh, and I’d definitely add Tana Toraja funeral traditions – bloody, jaw dropping and absolutely weird for a christian (so-called) community. This article has an in-depth look on the rites of the dead for the Toraja people. Visiting them in the interiors of Sulawesi is definitely in my bucket list. I currently live in Taiwan (and have been living here for 15 years) and I have never seen or heard of the striptease at a funeral. However, they do have marching bands leading the procession to the graveyard and they burn a ‘BMW paper car,’ a ‘paper house’ and other paper material objects so the deceased will have them in the after life. WOW, Taiwan seems like a really bizarre country when it comes to funeral traditions… WOW! I actually have never heard about this funeral tradition and I am Taiwanese. I wish there are more about Taiwan because Taiwan is also one of very pretty island-country! Thanks for sharing these funeral traditions. I think my favorite has to be the tradition of using designer caskets. It is one argument for getting buried instead of cremated. If I do decide to do a traditional burial I will definitely want a great casket like one of these. I think all these traditions are really interesting. 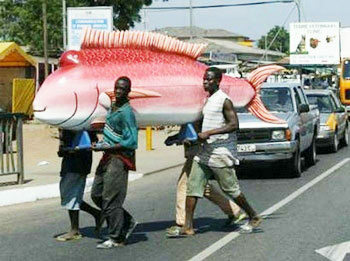 I really want to go to Ghana and design my own coffin. When I leave this life I want to go out with a bang. I’d want my funeral service to be just as awesome and people to have the service represent all sides of me including the quirky side. there are some pretty weird traditions – like digging up the body and then dancing with it uhhhhhhhh!!! While your paragraph about the Philippines & China does not state this as norm for these countries, your readers may interpret them as such. 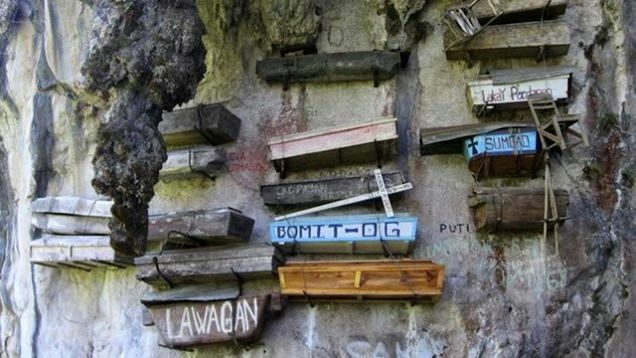 The Philippines, which I can speak to having lived there, does not see hanging coffins as a “norm.” What your saw most likely in Sagada was a unique tradition of that community turned into tourist attraction. The Philippines, does however sometimes bury the dead above guard. I was going to write what Ricardo said about Philippines. Sagada is an amazing place to visit, but it’s not typical. Traveling to Lebanon Solo: Is It Safe?